Hello! I’m Vicki Michela Garlock, founder of Faith Seeker Kids. We offer Bible-based interfaith educational ideas for kids of all ages. Please enjoy the site! 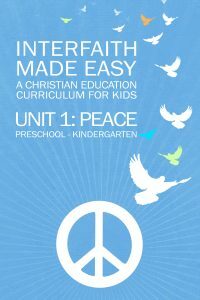 And don’t forget to check out our interfaith curriculum for kids! Unit 1: Peace is out! Our mission is to help churches and families recognize the importance of interfaith education for children and to provide resources and tools to facilitate that education.Our mission is grounded in the belief that we are all life-long faith seekers.Each of us must reach our own understanding of God/the Divine/the Great Mystery. Each of us must develop our own faith practice. Each of us must choose how to live a life that is both meaningful and compassionate in a world that often seems heartless and unfair. And each of us must acknowledge that this process is ongoing, changing over time as a result of development/aging and life experiences. In short, our mission is to transcend the religious/spiritual distinction so we can teach our kids to find their faith. This site offers news, information, and tips for adults who want to help the kids in their lives follow their own faith path – a path that potentially draws from numerous traditions. There are many ways to view God and many ways to articulate who/what God is. God might be envisioned as a divine force outside of us, as a grounding strength within us, as a powerful energy residing in all living things, as a combination of those ideas, or as something else entirely. But it can be difficult for individuals to reach their own understanding of The One if they are required to adopt a single, pre-determined viewpoint. The same can be said of a faith practice. Weekly church services, daily sitting meditation, hikes in the woods, cooking for a group of friends, and dancing ecstatically have all enabled people to connect with the Divine. There are innumerable ways to touch life’s great mystery, and one size does not fit all. If we want to help our children find their place in the world – in times of joy and in times of sorrow – we need to provide them with faith-seeking tools that will serve them throughout their lives. Inherent in this approach, is a deep appreciation for the faith of others. It is simply not enough to tell children, “Be tolerant.” It is extremely difficult for humans to be tolerant of things that they don’t understand, that they’ve never heard of, or that seem entirely foreign. Evolutionarily, it was in our best interest to protect ourselves from “the other.” There are still some advantages to this approach, such as when we tell young children not to talk to strangers. But the global nature of our world is forcing us to move beyond a confining and limiting Us-Them viewpoint. 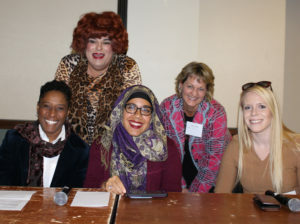 Religious belief and practice is often divisive. It’s time for that to change, and children are the place to start.This site offers various resources to help churches and families. Many thanks to TazDigital for the video and the thumbnail image.